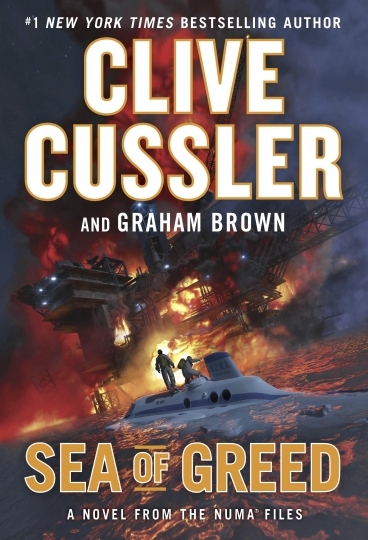 "Sea of Greed," the latest entry in the NUMA Files series, pits Kurt Austin and his colleagues against a seemingly unstoppable enemy. Austin runs the Special Assignments team for the National Underwater and Marine Agency (NUMA). He's working near the Gulf of Mexico with Joe Zavala, his partner and best friend, when they hear a loud explosion from over 12 miles away. They hurry to the site to discover burning oil rigs. The two men rescue several workers, but when they leave the area, they both notice the fire doesn't burn like a standard oil fire. They want answers but are called back to Washington for another assignment. The president wants NUMA to uncover the mysterious depletion of the world's oil. Sites that weeks ago appeared to have the liquid gold in abundance for decades suddenly run dry, and it's been happening all over the world. When the news leaks about the sudden lack of oil, prices will skyrocket and potentially bankrupt major nations that rely on the substance to fuel their economies. Can NUMA uncover the truth and once again save the world? The villain is diabolical, our heroes seem to have no way to win, and the action is relentless. In other words, the story is classic Cussler. The thought of the world running out of oil is terrifying, and that along with the wonderful cast of characters makes this one of the better entries in the NUMA Files series.